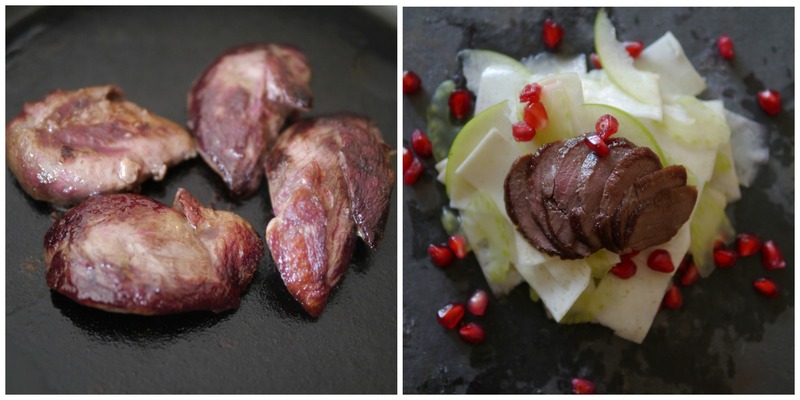 Wild woodpigeon is a naturally dark game meat that offers a subtle gamey flavour. Prepare a medium sized bowl of iced water and put to one side. Remove the pigeon breasts from the fridge, to allow them to reach room temperature. Remove the skin from the celeriac using a sharp knife. Cut into inch thick slices and then cut those into inch square batons. Put the edge pieces to one side, so that you are only left with rectangular pieces of the same size. Using a potato peeler or mandolin, thinly slice the batons so into ribbons and place in the bowl of iced water, to prevent them from browning. Peel the stick of celery to remove the nasty stringy bits. Cut off the root end and lay flat the top end on a chopping board. Using a sharp knife, slice the celery on the diagonal, very thinly. Add to the bowl of iced water. Take your apple and place on the chopping board. Again, using a sharp knife, remove the bottom of the apple and discard. Slice the apple very thinly whilst rotating, avoiding the core, so that you are left with little slivers of apple; each with a bit of the bright green skin! Add to the bowl of iced water. Cut the pomegranate in half and place one half, cut side face down, in your palm. Over a bowl, use a wooden spoon to hit the back of the pomegranate. The seeds will pop out quite rapidly, so be sure to wear an apron! Place the bowl of kernels to one side. To make the slaw dressing, take a clean jam jar; pour in a glug of the olive oil and apple cider vinegar, followed by the lemon juice. Screw the lid on and shake until well incorporated. Season. Place in the pan and fry for 2-2.5 minutes on each side. They are best when a little pink in the middle. Remove from the pan and let rest on a board. Remove the slaw vegetables from the bowl of iced water, drain and pat dry with some kitchen paper and place into a bowl. Lightly dress and toss together with your fingers. This entry was posted in Recipes and tagged field & flower, food, game, meat, recipe, wood pigeon. Bookmark the permalink.